We need 20 participants, 1 person for each country. The recording process will take place in the Multimedia Department on UMM Dome (every Thursday in March from 13.00 to 17.00. In the first part, every participant have around 20 seconds for describe uno or two habits / traditions from his / her own country. It can be serious, funny, weird... (this part should be in the native language of the participant). In the second part, the participant will be asked about habits or traditions of 5 different countries given randomly (for answer this question, the participant should use English language). 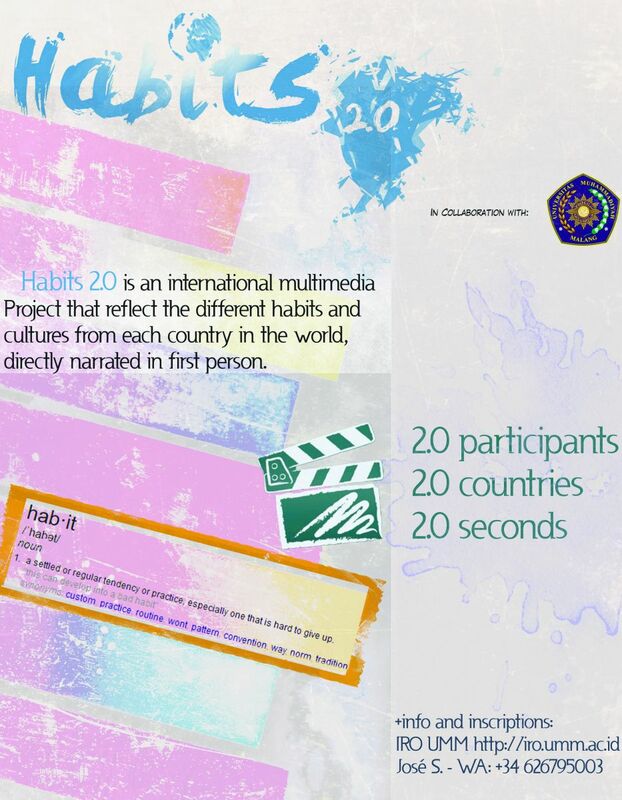 Habits 2.0 is an international multimedia Project that reflects the differents habits and cultures from each country in the world, directly narrated in the first person and using the original language, subtitled initially to english language. Adding further, a cross of views and opinions about the different countries that make up the geographical map from different perspectives (habits, prejudices..). With this multimedia project we want bring closer the countries to the spectator and add a fresh idea to internationalisation process at UMM. The goal of Habits 2.0 is reach many people as possible from all the countries. Share knowledge, create closer links between the different cultures and traditions. The final version of this project / documentary will be shared in the whole world, will be presented to diferent short movie festivals respecting the name of the author and his sponsor. We hope in the future this multimedia project will become in an icon of internationalizacion.